Anchored by the largest city in Tennessee and the state’s capital of Nashville, Davidson County is bursting with charm and expanding every minute. Comprised of the city of Nashville and its direct surrounding suburbs, Davidson County offers its residents an ideal urban lifestyle. Residents are connected to some of the region’s most easily accessible transportation arteries and a public transportation system that continues to improve in and around Nashville. According to statistics from the U.S. Census Bureau, the population of Davidson County was around 668,347 as of 2014, 609,600 of which live in the city limits of Nashville. And no matter where residents are in Davidson County they have access to a burgeoning economic landscape. Small businesses, startups and major corporations are fluttering to the market, offering a wide variety of employment opportunities in the area. The Nashville Chamber of Commerce reported the top employers in the area to be Vanderbilt University & Medical Center, Nissan North America, HCA Holdings Inc., Saint Thomas Health Services, Randstad, Shoney’s Inc., Electrolux Home Products, Kroger Company and Cracker Barrel Old Country Store. Like many other metropolitan areas throughout the nation, Nashville and its surroundings are experiencing a boom in transportation options. In addition to the typical bus and rail systems, Nashville has implemented the BCycle bike share program that helps residents get around town easily with their health and the environment in mind. The city also boasts the Music City Star Regional Transportation Authority, which reaches commuters in Belle Meade, Goodlettsville and Nashville. With Nashville as its epicenter, Davidson County residents have access to Interstates 24, 65, 40 and 440 as well as a number of State Highways and other major roads. Traveling throughout the world is even accessible here with the Nashville International Airport and John C. Tune Airport nearby. The hub of downtown Nashville is filled with vibrant spirit, rich culture and, of course, a lot of music. 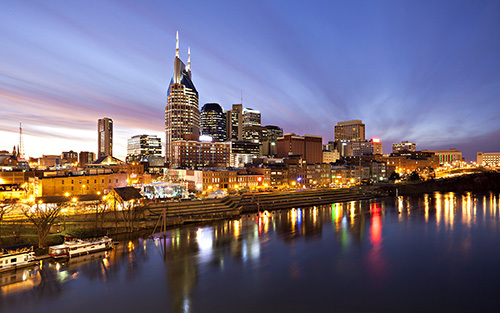 Music City is the hub of all that is country and soul music and much more, with modern musicians rooted in rock ‘n’ roll venturing to the Tennessee capital to find inspiration. Because of this, the music capital is quickly finding itself becoming an international oasis for musicians and music lovers alike. Beyond that, Nashville is home to a number of sports venues that host national league teams, including the National Football League Titans and National Hockey League Predators. Additionally, with Nashville’s warm climate it’s an ideal place to swing a few balls on the greenway. Vanderbilt University is also located within the city’s limits, giving residents a local college team to root for. There are also a variety of annual events, such as the Franklin American Mortgage Music City Bowl, Gaylord Opryland’s A Country Christmas and the annual Antiques and Garden Show of Nashville at The Music City Center. And that’s just scratching the surface. Throughout Nashville’s many unique neighborhoods, small events and festivals take place all year long.